Here at Keyes Toyota, we've noticed that more drivers are looking for green cars these days. 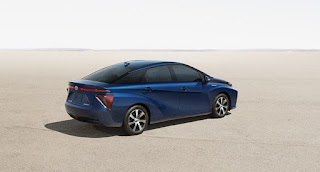 Whether you're interested in lowering your carbon footprint or you just want to save money at the fuel pump, a hybrid like the 2018 Toyota Prius could be just what you're looking for. The Toyota brand also recently introduced another unique green vehicle in the state of California recently and this model, the Toyota Mirai, just hit a major sales milestone. The Toyota Mirai is a unique green vehicle for a few reasons. First, it's only available in one state for now. Second, it's not an electric car or a plug-in hybrid. Instead, this model is powered by hydrogen. This fuel cell sedan can travel around 312 miles on one tank of hydrogen, which is pretty impressive. A model like this could help tackle the “range anxiety” issue, which is when drivers worry that a green car won't be able to get them to their destination on a single charge. The Toyota Mirai offers an impressive range and we're sure that it will improve in future models. Considering it's only available in one state, it's even more noteworthy that the Toyota Mirai is celebrating the sale of 3,000 units. This may not sound like a lot, but there are currently only around three dozen charging stations in the state, concentrated around Los Angeles and San Francisco. As more fueling infrastructure is built out, we think that even more drivers will take a closer look at this unique vehicle. The Toyota Mirai proves that hydrogen fuel cell cars can be viable, and we can't wait to see what other kind of green cars the Toyota brand will build. So when you're looking for a car brand that's always working on new green tech, talk to a Toyota dealer in Los Angeles. We can answer your questions about green cars and the latest features. We look forward to meeting you and helping you find a new vehicle!